It was like the final scene from a survival movie. 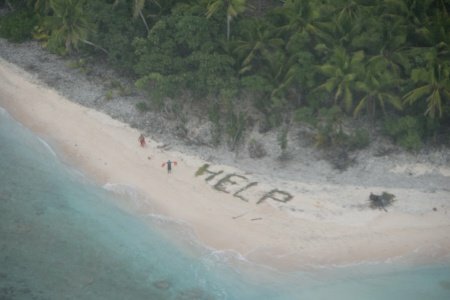 A plane flying overhead spots a distress call, an actual call for “HELP” spelled out in palm fronds on the beach of a deserted island. Three stranded boaters were spotted by a Navy plane after they had gone missing for three days in Micronesia. The trio reportedly swam through the night to an island after a wave overtook their boat just hours into their journey, according to the Associated Press. After they failed to show up at their destination a search crew was launched that included two large cargo ships and a Navy aircraft. The men were eventually spotted several hundred miles north of Papua New Guinea near the distress call waving their orange life jackets. “Our combined efforts coupled with the willingness of many different resources to come together and help, led to the successful rescue of these three men in a very remote part of the Pacific,” said Lt William White, a coast guard spokesman, in a statement. White later told ABC News that rescuers first spotted a signal fire the castaways sent. Based on how this rescue played out, these castaways apparently did everything right. If you ever find yourself on a deserted island the same survival rules apply. First steps are shelter, fire and water and building a distress call.